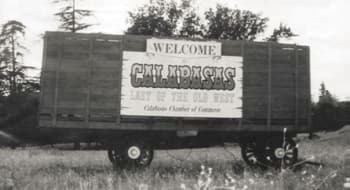 The city of Calabasas was incorporated on April 5, 1991, when Calabasas had one municipal property. Today the city owns or operates an array of thirteen properties, including several parks and recreation facilities, along with the Calabasas Civic Center, site of City Hall, the Municipal Library and Senior Center. CENTURIES AGO, the Chumash Indians led a peaceful existence amidst the rolling hills of Calabasas. Spanish explorers were the first Europeans to arrive in the area. In 1770, an expedition headed by Gaspar de Portola crossed through Calabasas on its return southward to Mexico after venturing into Northern California. In 1776, another party of explorers led by Juan Bautista de Anza camped in Calabasas on their way northward from Mexico. Present-day Calabasas Road was once part of the historic El Camino Real (The King’s Highway), a pathway dating back to 1769 that linked Spanish settlements and missions up and down California. Bisecting Old Town Calabasas, this thoroughfare runs through the heart of the city today. 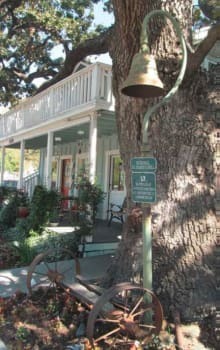 Old Town has some of the region’s longest-surviving structures, the most prominent of which is the Leonis Adobe. The Leonis Adobe stands frozen in time, a rustic reminder of a bygone era. 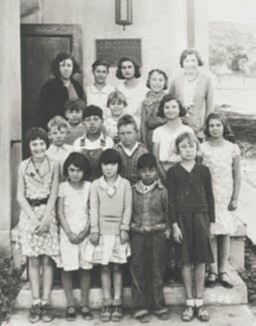 It once served as a seat of a much larger parcel, Rancho El Escorpion, which covered around 1,100 acres of land in the southwest San Fernando Valley. The adobe was originally built c. 1844 and after passing through a series of owners was ultimately saved from demolition in the 1960s. It was then renovated, dedicated to the public, and designated as a historic cultural monument. Calabasas remained a rural enclave well into the 20th Century, which a small population and limited interaction with outsiders. 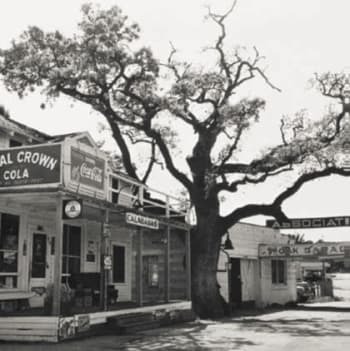 Tales both true and tall portray Calabasas as a rugged outpost of the American West, complete with an ominous hanging tree in the middle of town. All of this was to change as California entered a period of explosive growth. The first planned housing subdivision in Calabasas was Park Moderne, originally settled by artists, craftsmen, and writers. Dating from the 1920s, many of its original units are still intact and reflect some of the most intriguing residential architecture in California. The topography in and around Calabasas is breathtaking; as testament to this fact, it has been a favorite location for filming motion pictures since the early 20th Century. To date, 43 percent of the land within Calabasas is protected open space, a figure that dwarfs most other cities in the area. Perpetual preservation of open space and resources, along with severe restrictions on future development, as specifically enshrined in the Calabasas Municipal Code. The legend of the hangman’s tree implied that just outside the jail was a white oak tree used for hangings. Although no one was recorded as being hanged, the tree was an icon, even when the gas company came to Calabasas and ran its pipeline through the roots and killed it. Later, Calabasas was part of the route to truck a Rocketdyne rocket engine overland to its test site. The large engine could not fit between the gas station pumps and hangman’s tree on Calabasas Road, so the dead tree was removed. The remaining portion of the dead tree was installed in concrete outside the Sagebrush Cantina, where it eventually rotted. The tree was then removed and relocated nearby and lies there today. 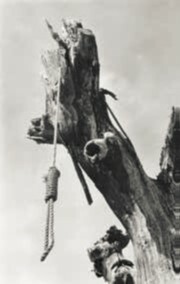 The Calabasas Chamber of Commerce incorporated the hangman’s tree as an icon for their newsletter publication, Noose Notes. Local complaints about the title reference resulted in a name change.